Four new, high-capacity gas and electric griddles have been added to the heavy-duty Opus 800 range of prime cooking equipment. The new 600mm and 900mm wide, 800mm deep gas and electric powered griddles offer a larger cooking area than the Opus 700 equipment they have replaced. In addition to being deeper, the cooking plates now extend right to the edge of the units to provide maximum capacity. Drip trays have been re-designed too, to provide additional capacity. 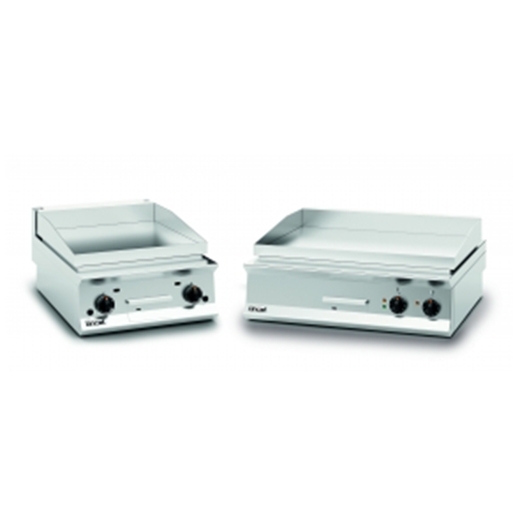 Each griddle features independently controlled heat zones, for flexibility and economy during quieter periods. Precise temperature control in the range of 90oC to 280oC for the gas griddles and 90oC to 300oC for the electric griddles, ensures consistent results and energy efficient operation. Power ratings are as follows: electric models 8kW and 12kW; gas models 15.5kW and 23kW. Easy-to-clean chrome griddle plates are available as an alternative to machined steel. They only produce heat when food is placed on the griddle plate and, as a result, radiate less heat into kitchen environment. This creates a more comfortable working environment and saves on energy. Half-ribbed cooking plates are available too, to give food an attractive, branded appearance. Gas models are equipped with piezo ignition, pilot burners for standby operation and flame failure protection.